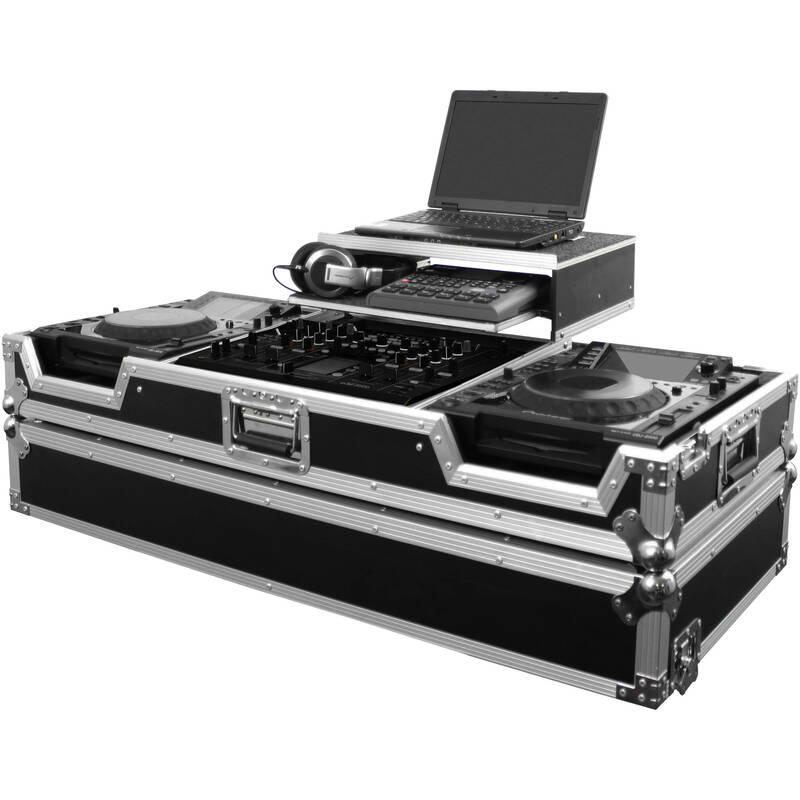 The black/chrome FZGS22000W Flight Zone Glide Style DJ Coffin Case from Odyssey Innovative Designs comes with Odyssey's patented Glide Style laptop platform that allows you to have access to your files and emails during your gig. Your laptop slides effortlessly back and forth over the mixer and is positioned to suit your need and comfort. It's rated to hold your Pioneer DJM-2000 DJ Mixer and two large tabletop CD/digital players. The case is made from 3/8" plywood and is ATA 300 (Airline Transportation Administration) rated. The heavy-duty ball corners guard the case from rough contact while in transport. It's carried by recessed handles and secured by recessed, spring-loaded butterfly latches. The built-in corner wheels make transportation up and down ramps easy. The mixer remains inside the case with extra room underneath for accessories or other gear. The bottom of the case is well ventilated to assist with heat dissipation and air flow. The front has a removable V-Cut panel that gives you full access to the front in and output jacks. Cable and accessory management is achieved with a spacious area beneath and behind the controller. The case is backed by Odyssey's limited lifetime warranty.